Excessive sugar consumption is on the no-no list these days, as more people are becoming aware of the damaging health effects of overconsumption. Sugar, or more specifically glucose, provides energy and fuel for the brain and the body. Long ago, our ancestors depended on sugar-rich foods for the energy and the fat storage necessary for survival. Consequently, the human brain evolved with a voracious, almost insatiable appetite for sweet foods. Today, however, added sugar is ubiquitous in the human diet and, unfortunately, from an evolutionary standpoint, this overindulgence of sugary drinks and the propensity to eat processed rather than fresh foods harms more than helps. While added sugar is difficult but not impossible to avoid, awareness of the added sugar content in dietary foods is essential to maintain or improve health. There are over 60 different names for added sugars that can be found in approximately 74% of processed foods, all meant to prevent the consumer from easily deciphering the sugar content of the food. Some of these names you will recognize and some you may not: agave nectar, barley malt, cane juice, corn syrup, fructose, dextrose, glucose, high fructose corn syrup, malt syrup, maltose, sucrose, treacle, turbinado, sorghum and multiple names for syrups and other sugars. 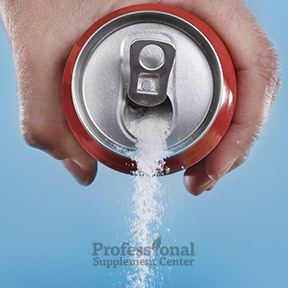 It’s important to note that when metabolizing sugars, the body doesn’t distinguish between different types of sugars. According to the National Institutes of Health, 15% of the calories in the American diet come from added sugars. And according to the Obesity Society, this number may be as high as 30%. That equates to about 22 – 28 teaspoons each day, mostly sourced from sugary drinks, such as soda, energy drinks and sports drinks. To put it in perspective, this non-nutritive calorie source results in consumption of an extra 500 calories daily. Even fruit juice should be consumed in limited quantities, as once the fiber is removed, the sugar content of the juice may spike blood sugar and offset the nutritional value. If you eliminate the majority of added sugars from your diet, you can enjoy that occasional sweet treat without sabotaging your health. In other words, if you eat real food, then you don’t have to worry so much about sugar intake. As discussed in Part 1 of this series, new nutritional labels propose to include added sugars in addition to the natural sugar contained in the food. While big food and big sugar corporations are engaged in fighting the labeling and ultimately preparing for damage control, you can do your part by limiting your consumption of added sugars. By eliminating processed foods and sugary drinks and opting for water and dietary foods such as fiber-rich, whole fruits and vegetables and dairy products that contain only natural sugars, your body receives hydration, vitamins, minerals, antioxidants, phytochemicals and other nutrients that are considered part of a healthy diet. Sugar and obesity – While recently a large corporation blamed the obesity epidemic on the amount of food that people eat and their lack of motivation to exercise, some scientists say these are consequences of, rather than the cause of, the obesity epidemic. While added sugars increase excess energy, they reduce the nutrient density of our diets and contribute to weight gain, obesity and diabetes. Sugar and aging – Research has shown that a poor diet negatively impacts memory and may increase the chances of developing dementia and Alzheimer’s disease, while whole, unprocessed foods help to boost memory and improve overall health. While earlier studies have shown that diabetes and other conditions that make it hard to control blood sugar levels were a possible contributor to the development of Alzheimer’s, newer findings also suggest that high blood sugar causes the accumulation of plaques in the brain which have harmful effects on cognitive function. Sugar and the brain – Brain cells require glucose for fuel and brain power. Brain neurons do not store glucose, so a steady supply obtained from grains, legumes, fruits and vegetables is necessary. Excess sugar and refined carbohydrates can actually deprive the brain of glucose, depleting energy stores and compromising your power to concentrate, remember and learn. Additionally, studies have shown that sugars increase dopamine release, which over time leads to prolonged dopamine signaling, greater excitation of the brain’s reward pathways and the increased craving for more sugar, similar to other addictive substances. Sugar, diabetes and insulin resistance – The insulin hormone facilitates the transfer of glucose from the bloodstream and basically unlocks the body’s cells so that they can use glucose for energy. A repeated overload of sugar takes a toll on the body’s ability to respond to insulin. As a result, when insulin receptors malfunction, the body becomes insulin resistant and blood sugar levels remain high, even as the pancreas continues to secrete more and more insulin in an effort to maintain glucose movement into the cells. In time, insulin resistance can lead to type 2 diabetes and high cholesterol and blood pressure levels. Sugar and belly fat – Belly fat is visceral fat, the fat located between your abdominal organs. According to Harvard Medical School Publications, visceral fat is particularly concerning, as it’s considered a key player in numerous health problems. Insulin is a fat storage hormone and insulin resistance leads the body to generate belly fat. The good news, belly fat can be reduced by increasing physical activity, eliminating excess sugar and eating more high fiber whole foods. Sugar and your heart – According to the American Heart Association, added sugars significantly increase your risk of dying from cardiovascular disease. Excess sugar contributes to obesity, high blood pressure and high cholesterol levels, all factors in heart disease risk. High blood sugar levels can damage heart muscle function as well, and one 15 year study showed that the odds of dying from heart disease rose in tandem with the percentage of sugar in the diet. Current recommendations support limiting sugars not naturally found in foods to no more than 6 teaspoons or 100 calories a day for women and 9 teaspoons or 150 calories a day for men. Sugar and your liver – Excessive sugar consumption can lead to non-alcoholic fatty liver disease. While glucose can be metabolized by all body cells, only the liver can metabolize fructose. When the liver stores excess sugar as fat, it can lead to insulin resistance, the first step on the road to diabetes, metabolic syndrome and heart disease. It’s important to note that it’s the excess fructose, such as the ubiquitous high fructose corn syrup, that cause health problems, not the natural fructose found in whole fruits, which also contain fiber, water, nutrients and a low energy density. PGX® Daily by Bioclinic Naturals – This clinically studied proprietary complex contains three viscous, natural, water-soluble polysaccharides or fibers that have been shown to effectively reduce the glycemic index of foods when consumed simultaneously. Fiber viscosity is associated with increased satiety and reduced appetite. This product improves regularity and supports healthy glucose and cholesterol levels already within the normal range, contributing to healthy glucose metabolism. Gluten and dairy free. Cinnamon with Chromium Picolinate by PhysioLogics – This product supplies clinically studied, bioactive ingredients for support of sugar, fat and nutrient metabolism. Traditionally used for overall wellness in Chinese medicine, cinnamon has been shown to enhance vitro glucose uptake and glycogen synthesis. Highly absorbable chromium picolinate is an essential trace element that supports proper carbohydrate and lipid metabolism. Gluten, soy and dairy free. Alpha Lipoic Acid 400 mg by Pure Encapsulations – This multifunctional and versatile water and fat soluble nutrient supports healthy glucose metabolism. As a potent antioxidant, ALA provides free radical protection and promotes healthy cardiovascular and blood vessel function. Gluten and soy free, Non-GMO, vegetarian formula. Berberine-500 by Thorne Research – Sourced from Indian Barberry extract, this natural botanical alkaloid compound aids in the maintenance of healthy lipid levels, provides cardiac support, benefits glucose metabolism and may help reverse insulin sensitivity. Gluten, soy and dairy free, Non-GMO formulation. Ultra Glucose Control™ 30 Day Vanilla or Chocolate by Metagenics – This product is formulated for the nutritional management of the glucose response and sustained energy release. Designed for those who need additional support controlling their blood sugar levels, this formula delivers a ratio-balanced combination of pea and rice protein, slow-release complex carbs and monounsaturated fats in a 40-30-40 balanced ratio. Non-GMO formulation. This entry was posted in Home and tagged Alpha Lipoic Acid 400 mg by Pure Encapsulations, Berberine-500 by Thorne Research, Cinnamon with Chromium Picolinate by Physiologics, PGX Daily by Bioclinic Naturals, Professional Supplement Center, Sugar Consumption, Ultra Glucose Control™ 30 Day Vanilla or Chocolate by Metagenics -, Vitamins and supplements, www.professionalsupplementcenter.com. Bookmark the permalink.